This is based on a traditional French recipe that just melts in the mouth. 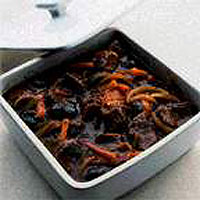 If you want to go out and leave this cooking use four large pieces of braising steak and cook for a minimum of 2 hours. Serve one piece of steak per person. Use Seville orange rind when the fruit is in season. Preheat the oven to 170°C, gas mark 3. Combine the seasoned flour and dried herbs on a large plate, add the beef and toss until coated in the mixture. Heat the oil in a large frying pan, add the onions and fry gently for 6-8 minutes, until soft and golden, then spoon into a casserole dish. Add the floured meat pieces to the dish with the carrots, orange zest, bay leaves and prunes. Combine the vegetable stock, tomato purée and wine vinegar. Add to the casserole, stir to mix, then cover with the lid. Cook in the oven for 2 hours, or until the beef is tender. Season to taste and serve with baked potatoes. Always use a vegetable peeler to take off thin slivers of orange peel. All the flavouring oils are found in the bright orange zest - the white pith underneath has a bitter flavour and should not be included.